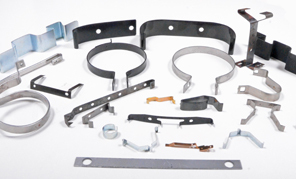 If you have a need for wire forms, flat springs, intricate springs, brackets, clips, flat terminals, or any stamped and formed metal components, they may be a natural candidate for FOURSLIDE STAMPING. 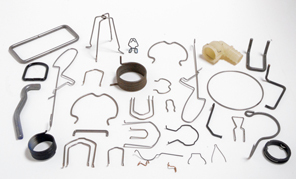 With our CNC wireforming capability, we can stamp wire into an infinite variety of forms, shapes, and sizes as you can see from the parts pictures on this page. Fourslide Tooling Costs less than Progressive Die Tooling. Complex forming operations that can’t be completed on a power press without expensive secondary operations can be formed easily on a fourslide. Our fourslide and multislide stamping process incorporates horizontal die applications from multiple directions and a range of motions, either simultaneuously or successively. The result is multisided stamping in a singular, efficient process. 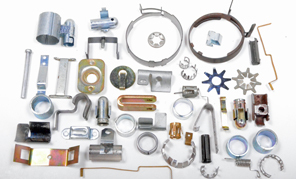 Forward Metal Craft is an ISO 9001-2015 supplier of custom fourslide stamping, multislide stamping, and wire-forms to many industries, both here in Michigan and worldwide. Forward Metal Craft has a team to assist you in the engineering, planning, and design of your project. 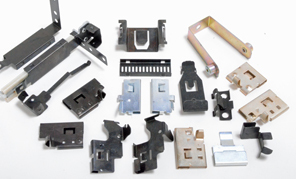 Our design and manufacturing services can offer substantial cost savings in terms of final part piece price. Our in house tool services allow us to build and maintain our production tools, giving us superior control of tool specification, cost, and production timing. Thank You for considering Forward Metal Craft for your fourslide stamping or wire forms project.